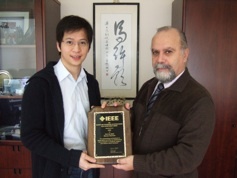 Our CASS member Elvis (Pui-In) Mak won the 2009 IEEE MGA GOLD Achievement Award. This award is to recognize his distinguished contribution to GOLD. IEEE CAS Society Pre-Doctoral Scholarships – they are in place since 2010, aiming to financially assist young members in purchasing their study and recognize their works. GOLD Session – GOLD/Technology Management Joint Session was held in ISCAS 2009 in Taipei. Experts around the globe shared their technology management skills. A PhD/GOLD Session and a WiCAS/GOLD Reception will be co-held in ISCAS 2010 in Paris. The theme of the Session is “Young Scholars to Become Successful Professors”. Both experienced and young professors will highlight their practices in purchasing their careers. Facebook Network – many IEEE CASS GOLD members have joined to share news and create friendships. *all GOLD members of CASS are highly encouraged to run the annual CASS BoG election. This award is to recognize those substantial projects or achievements of a relatively short nature (one to three years) but have left an undeniable imprint on the fabric of Graduates of the Last Decade (GOLD) operations. The award will be based on a selection that recognizes individuals or teams involved with GOLD activities who are recognized for singular achievement in the development and completion of a project(s) or activity(ies) which are directed to the fulfillment of one or more of the GOLD goals and/or objectives. The accomplishments of the candidate should be of "significant performance" and should have made a distinguishing contribution to GOLD. Up to six MGA GOLD Achievement Awards will be presented annually. For more information, please visit the award website. The purpose of the annual IEEE Circuits & Systems Society Awards is to illuminate the accomplishments of CAS Society members and celebrate their dedication and contributions both within the field and to the CAS Society. Award recipients are nominated by their CASS peers in order to honor the service and contributions that further strengthen the CAS Society. Nominations for the annual CASS awards are now being accepted. All nominations and reference letters must be submitted electronically by February 15, 2009, to cass-awards@ieee.org. Details can be found in the award page of the society’s website. Congratulations to all the new CAS Fellows! A full list of current Distinguished Lecturers can be found in the society’s website. In 2010, the IEEE Circuits and Systems Society will award two Pre-Doctoral Scholarships. Nominations must be submitted electronically to cass-awards@ieee.org by 15 February 2010.